My test drive of the 2019 Volkswagen Atlas has left me seriously considering buying one. The 7-passenger VW Atlas is big and functional, especially for families. It’s stylish, delivers great fuel economy and drives great. The Atlas my friends at Ontario Volkswagen gave me to test drive was a top-of-the-line with nearly every option. 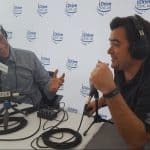 Continue reading to learn why my family might soon be rolling in an Atlas or click play below to hear the details in this iDriveSoCal Podcast. First, let’s address the Atlas’s size. Of the two sport utility vehicles that Volkswagen offers, the Tiguan and the Atlas, the Atlas is the biggest. For the most part, the auto industry is referring to the Atlas as a mid-sized SUV. But since all vehicles have gotten bigger the Atlas is arguably a full-sized SUV and the Tiguan a mid-sized. The Atlas, as I previously stated is a big 7-passenger vehicle. It has a maximum cargo space of 96.8 cubic feet with both back rows of seats folded down. You can put up to 3 child safety seats in the second row! That’s huge! 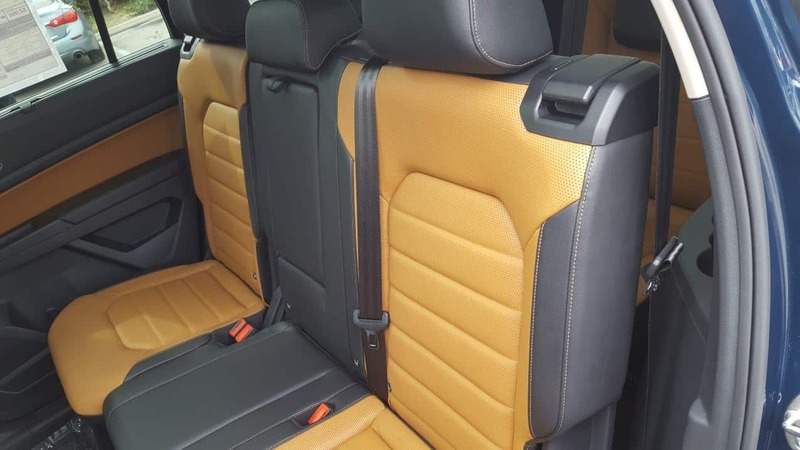 2019 Atlas 2nd row fits 3 child safety seats! I currently have a mid-sized SUV from a different manufacturer. And if I put my son’s safety seat in the middle then there’s hardly enough room for my wife (who’s small) to fit on either side of him. But in the second row of the Atlas you can have three (3) child safety seats in a row – that’s big. And super-handy for a family on the grow. 96.8 cubic ft. of flat-surfaced cargo space with seats down! 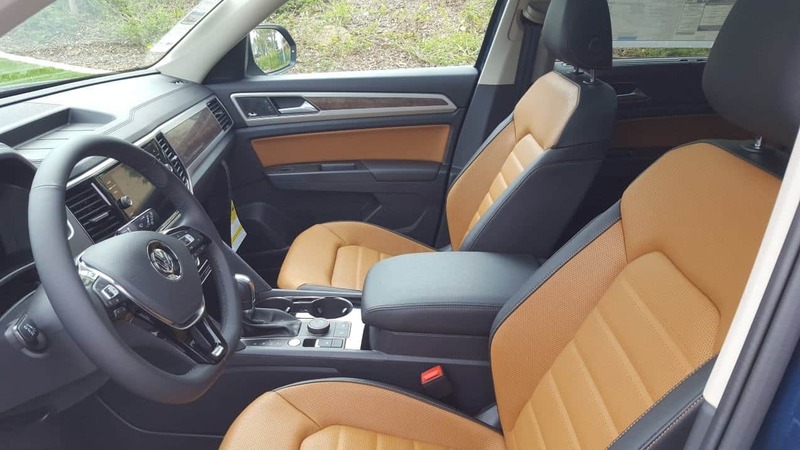 The 2019 VW Atlas is also highly versatile with the amount of interior space it provides for both people and our stuff. 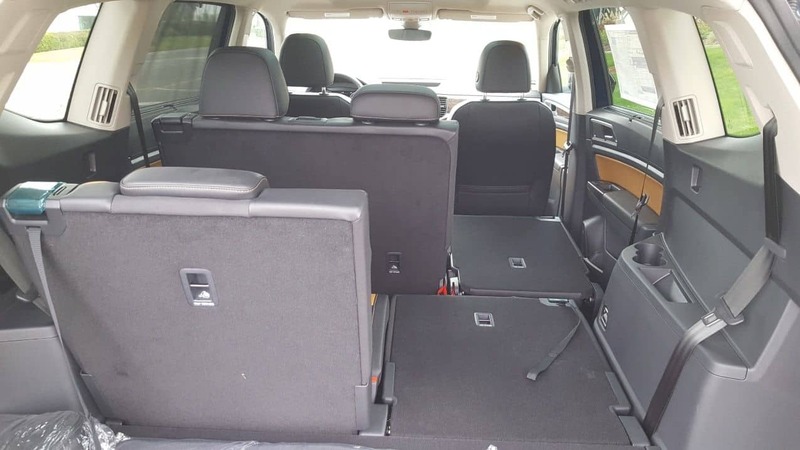 With the second and third row of seats folded down, you are left with a whopping 96.8 cubic feet of cargo space. And Volkswagen engineers really made it easy to change the seat/storage configuration. Logically placed, easy to grab levers and straps make it a cinch. The 2019 Atlas comes with two different engines. There’s a turbocharged, 2.0-liter, inline 4-cylinder that puts out 235-horsepower and 258 lb-ft of torque. And there’s the 3.6-liter V6 putting out 276-horsepower and 266 lb-ft of torque. The inline 4-cylinder is only available on the 2019 Atlas S base model, the 276-horsepower V6 comes in every other trim configuration. 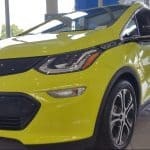 Regarding fuel economy, inline 4 will give you 20 miles-per-gallon in the city and 26 on the highway. The V6 will deliver 17-mpg in the city and up to 24-mpg on the highway depending on your configuration. 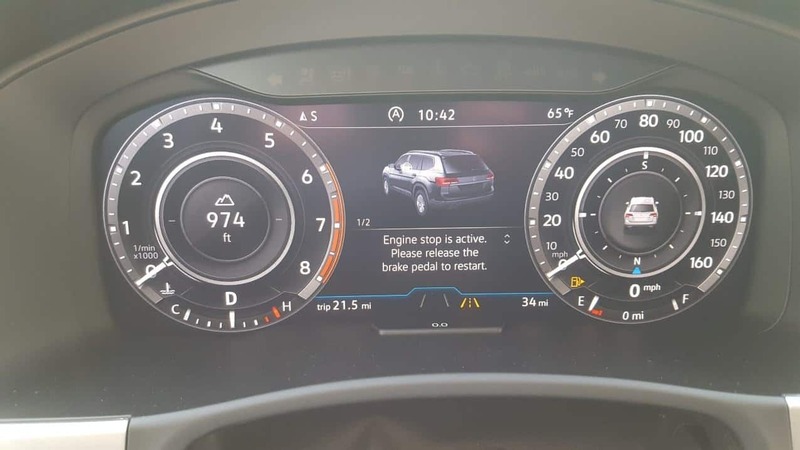 Fuel saving engine start-stop feature. 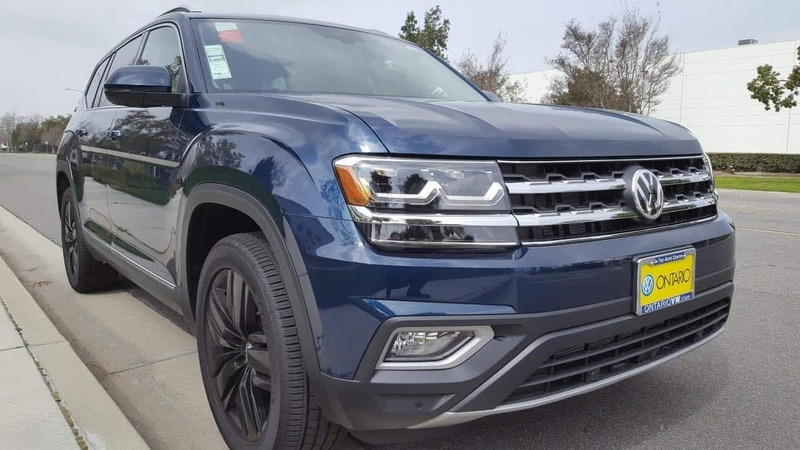 A great fuel saving feature the 2019 VW Atlas offers is a super-smooth functioning engine start-stop. It automatically turns your engine off during extended stops. When you depress the brake pedal the engine quickly turns back on and smoothly accelerates as you transfer your foot to the gas pedal. 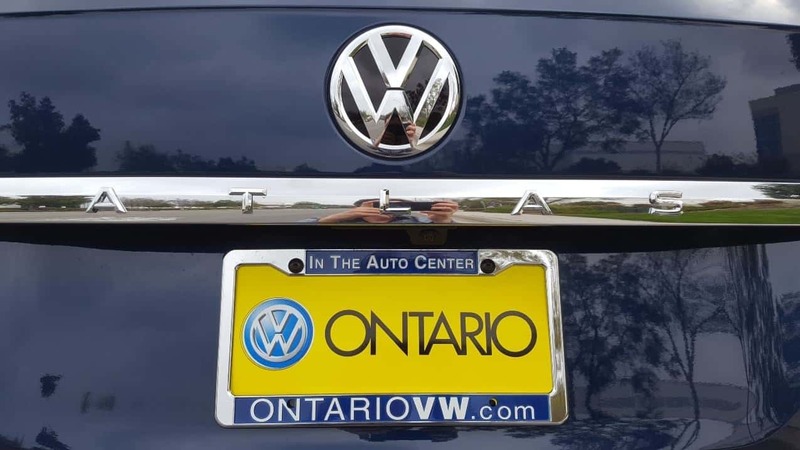 I love the styling of the 2019 VW Atlas my friends at Ontario Volkswagen had me test drive – outside and inside. Sure that’s partially due to the fact that I drove the V6 SEL Premium with 4Motion. But regardless of the top-of-the-line trim, the vehicle looks awesome. The beautiful and bold exterior lines give it a great balance of athleticism and class. Euro-styling that punches way above its price tag. The ingrained Euro-styling delivers a look that makes even the MSRP seem like a bargain. 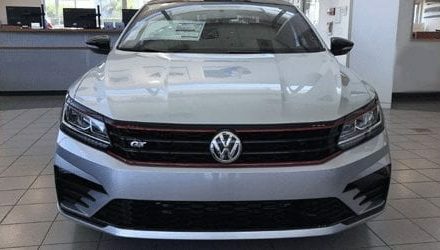 But don’t worry about MSRP, just go see my friends at Ontario Volkswagen and they’re going to give you the best deal in Southern California. RHalcomb [at] OntarioVW [dot] com. 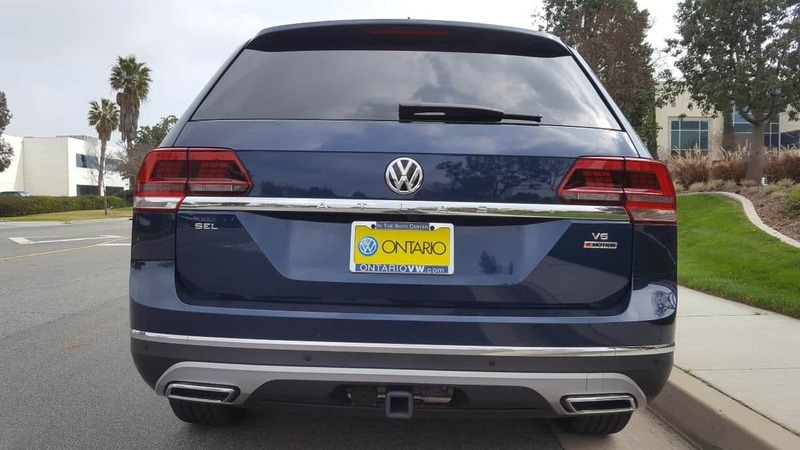 2019 VW Atlas courtesy of Ontario VW. 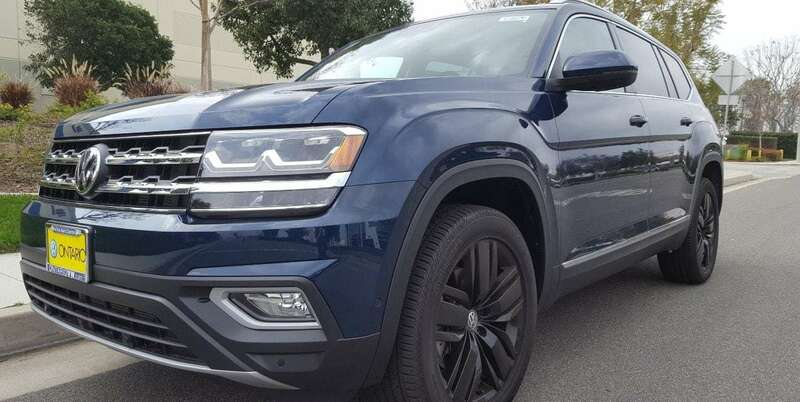 From front to back the 2019 VW Atlas expresses a powerful boldness that draws clear ties to its luxury sibling brand, Audi. And the fully-loaded Atlas that I drove delivered all the creature comforts of its luxury brand equivalent – without the huge price tag! 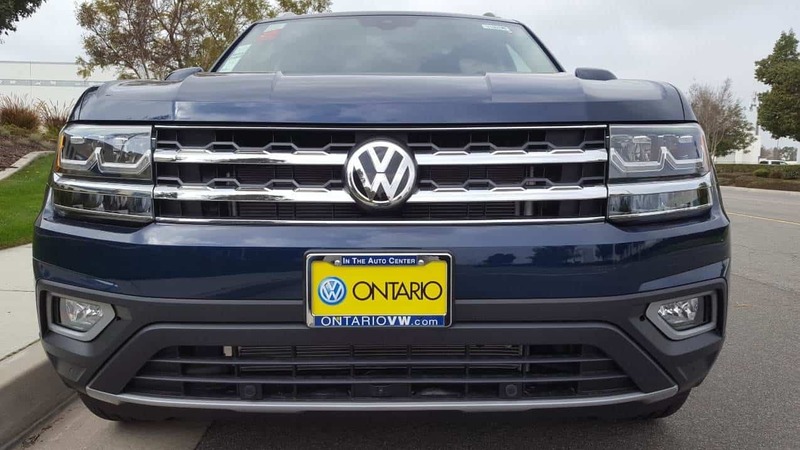 2019 VW Atlas from Ontario Volkswagen. The 2019 Volkswagen Atlas looks quite similar to it’s much pricier Audi sibling from many sightlines – especially from the rear. The inside of the Atlas is clean and clearly European but definitely punches above its price tag. I love the two-tone upholstery on the Atlas I drove! The grayish-orangish seats and door panels look great, very sporty yet still refined and luxurious. 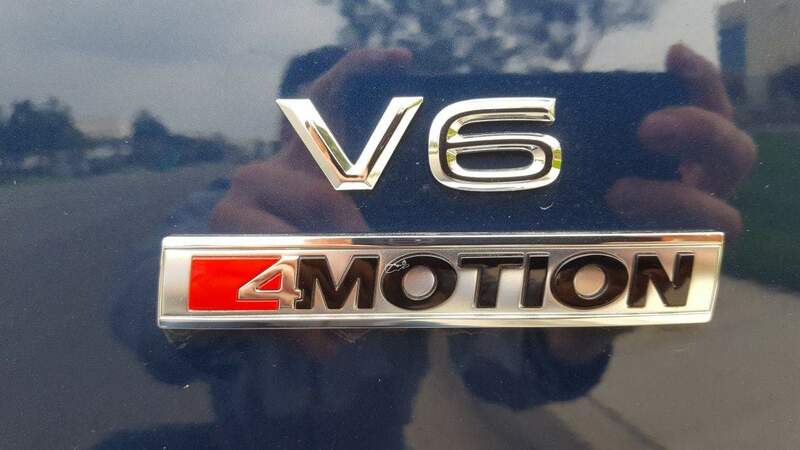 2019 VW Atlas V6 SEL Premium w/ 4Motion. And with styling like this, the Atlas easily bridges the dual purpose of family multi-tasker and executive client hauler without skipping a beat. And heck, that’s just the on-road analogies! The Atlas is still very much an SUV ready for wherever nature takes you – whether there’s a road or not. 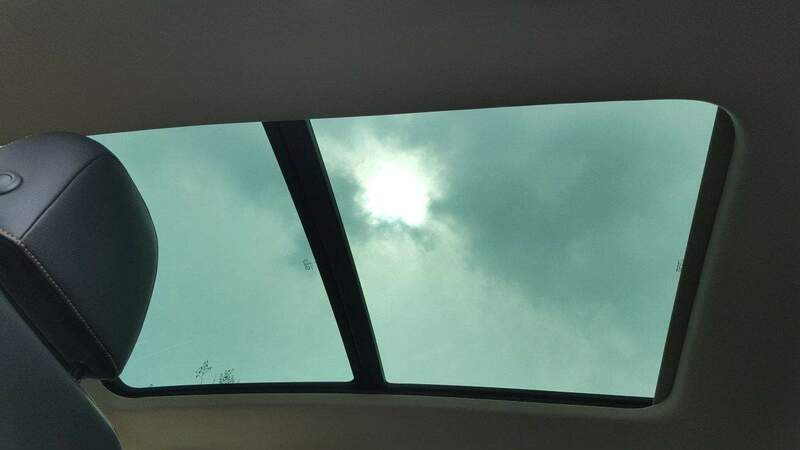 Another element of the Atlas that I love is the huge panoramic sunroof. Sure it enhances the interior styling but it’s obviously a beautiful and highly functional feature of the SUV as well. And just think of the stargazing you can do on a clear night away from the city lights! The panoramic sunroof is so big it’s hard to fit in a pic! Aside from the bold and beautiful two-tone upholstery, the Atlas’s cockpit is not only stylish but highly functional and wonderfully ergonomic. The Atlas’s interior is not only stylish but highly functional and user-friendly. Everything is laid out in a super-intuitive design and easy for the driver to use from the very first time you climb in. And while Atlas’s styling is ready for anything the SUVs functionality follows that form precisely. Read on to learn how Volkswagen is ahead of the curve with its digital cockpit technology. 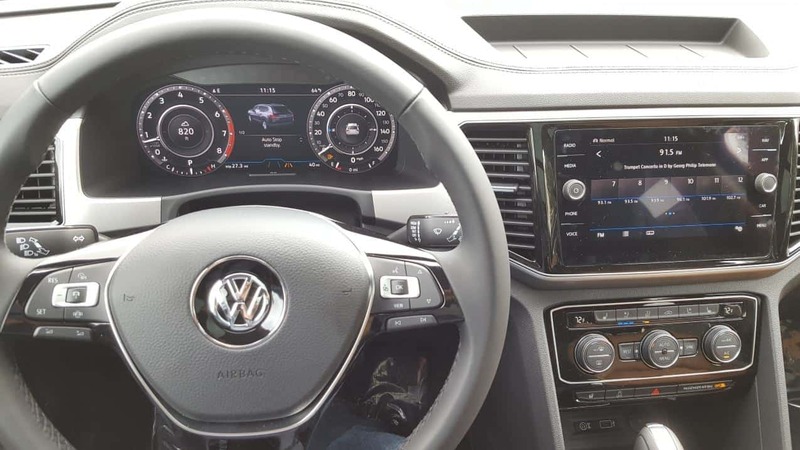 The 2019 Atlas offers Volkswagen’s Digital Cockpit which replaces traditional instrument clusters with high-resolution digital display. You can arrange the display in many different configurations. So many in fact that VW includes the ability to save up to 4 different driver profiles! Volkswagen’s Digital Cockpit is ahead of the curve! With the Atlas’s Digital Cockpit the vehicle is quite literally a computer on wheels. But VW makes all that tech simple to use with logically laid out switches, knobs, and buttons. All of it very user-friendly and easy to adopt for the driver new to the vehicle. Yeah! Fender Premium Audio. 480-watts! 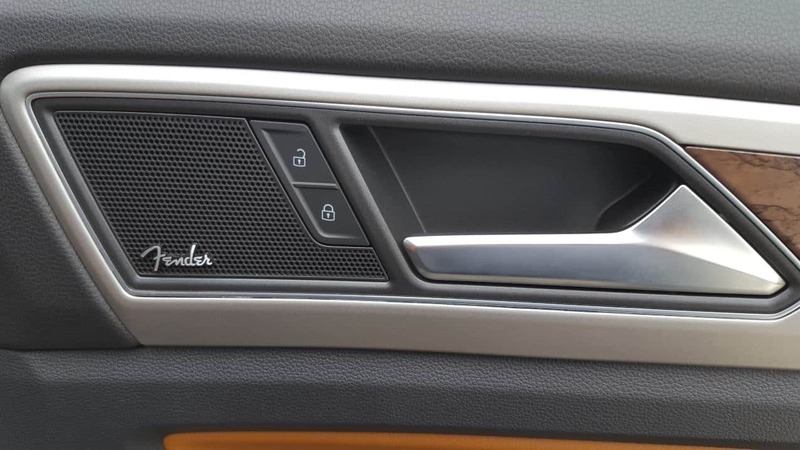 And speaking of audio, the available Fender Premium sound system is ridiculously clear. It actually adds an edgy-coolness to the Atlas’s image too! 3-zone automatic climate control is also available and I can never leave out the dual favorite of mine and my wife’s. Front seats which are both heated and ventilated. My wife’s seat is always on heat and mine is always on cool. 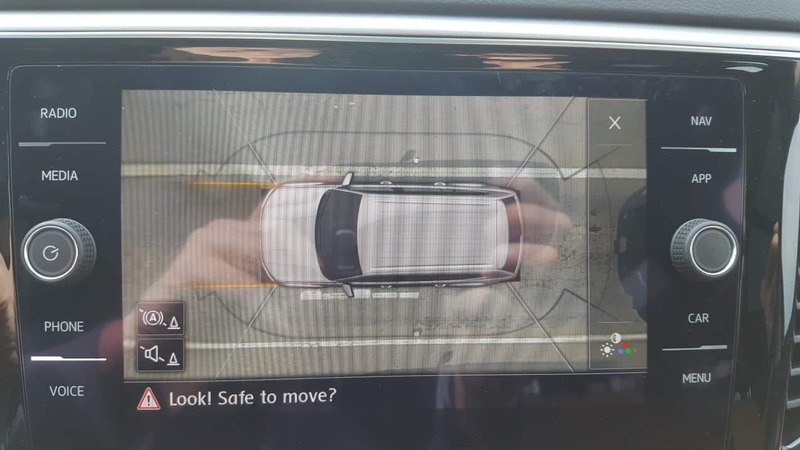 Another great available feature for the ’19 Atlas is the overhead view camera. Area View takes the safety in backing up to a whole new level. 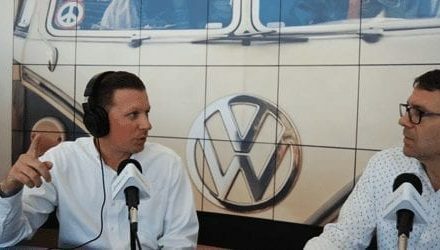 Here again, VW is ahead of the curve with advanced tech we’re sure to be seeing in all vehicles soon. And Area View happens to be one of the features in Volkswagen’s suite of Driver Assistance options. If you’ve driven a newer car in the past few years then you’ve probably experienced some of these features. They include Adaptive Cruise Control which helps maintain the distance between you and the car in front of you when the cruise is active. Blind Spot Monitoring which is self-explanatory. Light Assist manages your high-beams for you. Lane Assist helps to keep you in your lane. 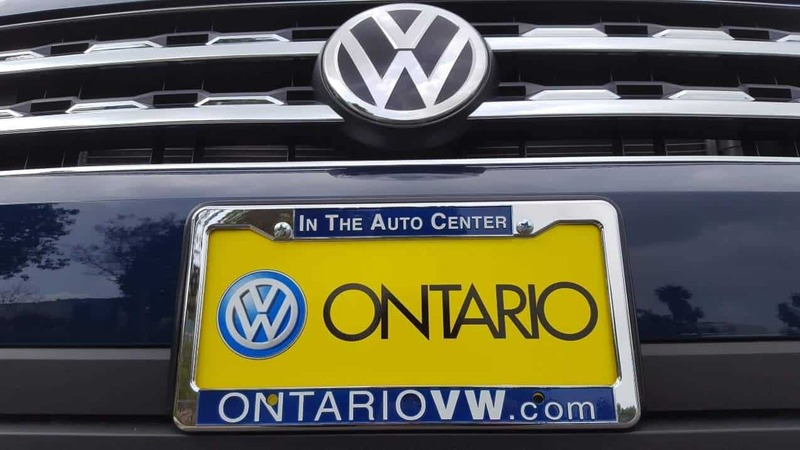 The 2019 Atlas from Ontario VW. Park Assist will help you steer into those tricky parallel parking spots. And Park Distance Control with Maneuver Braking helps you get out of them. Finally, Front Assist helps monitor and avoid forward collisions. And Front Assist includes Pedestrian Monitoring for additional accident prevention and overall safety. Size – The Atlas is big and functional but it’s still easy to drive. Styling – I seriously like the Atlas’s looks, especially with the two-tone interior. Drive – I didn’t elaborate too much but the Atlas delivers sure-footed confidence to the driver. 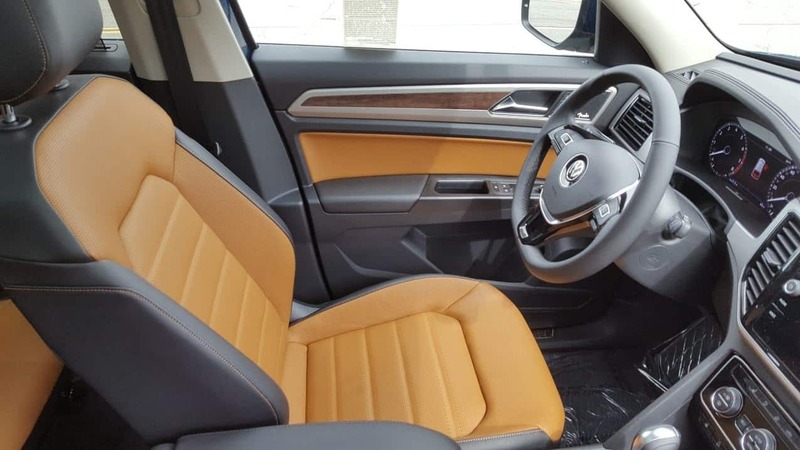 The 2019 Volkswagen Atlas is a great ride for you if you’re looking for a family vehicle. But it’s also a great option for hauling clients and colleagues. Plus its an obvious choice when you’re looking to haul lots of outdoor adventure gear. And let’s not forget about the industry-leading People First Warranty. 6-years or 72,000-miles bumper to bumper. And that warranty is even transferable should you trade-in or sell your Atlas on say… a newer Atlas! 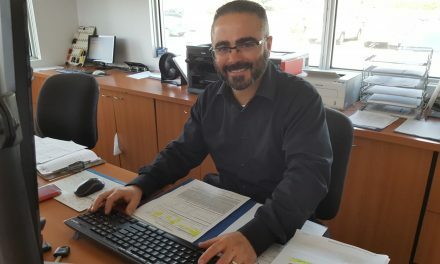 For more information on the Atlas and for all of your Volkswagen needs please go to my good friends at Ontario Volkswagen. 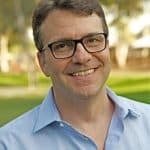 Again, Randy Halcomb RHalcomb [at] OntarioVW [dot] com is the iDriveSoCal go-to and I’m happy to connect you personally. Tom [at] iDriveSoCal [dot] com.